Faris comes from a rich family and is in a relationship with Rina, a music teacher from an average family. 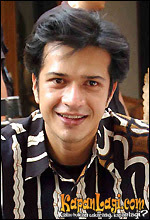 Faris’s father, Tirta, disapproves of their relationship and he forces Faris to marry Nia. Meanwhile, Rina is pregnant and gives birth to a baby girl. Nia’s younger brother then kidnaps the baby and leaves her at an orphanage. 16 years later, Nada, the baby who was left at an orphanage by Nia’s brother, has grown to be a beautiful teenager who loves music very much. She wishes to meet her parents in spite of not knowing where they are. She then runs away to Jakarta. Upon arriving at Jakarta, she almost meets with an accident but is saved by Rina. Unfortunately this doesn’t make mother and daughter close. Nada then becomes friends with the street beggars and they open a small stall in front of a grand school. As it turns out, Rina is the music teacher there. Nada then meets with Rina again. Their attraction for music slowly makes them get closer to one another. Meanwhile, Ricky, the school’s most popular boy, is impressed by Nada’s singing. This makes Rasti, Ricky’s girlfriend, jealous and she wishes to destroy and get rid off Nada. It gets known then that Rasti is the daughter of Faris and Nia. Will Rasti and Nada fight for Ricky’s love as their parents had done before? Or will this make Faris get back with Rina?? In this picture are two villians, Martin (left), Vanna (middle), and Flora (right). Martin and Vanna are horrible, evil people..... Vanna was a hired assasin in some part of the story to try to eliminate Nada. She also had a crush on Ricky thus, all the more reasons to get rid of Nada.. at the time I am writing this, she is incarcerated in the psychotic hospital for attempted murders on Nada. This is Susan, Susan was mean and horrid in the beginning but at the instigation of Nia. She wanted badly to be a headmistress in the school and she needed money. Apparently she was blackmailed and also paid to do so as she had an ailing father she would do anything to protect and cure. But eventually, she broke out of that mould and helped Rina and he school children the best she could. She however has a horrible son. Nonesoever then Martin. Erwin is interested in Rina and cares for her but has a dark history with Nia. Eventually, he became a little bad and assisted Nia in trying to get rid of Nada, while pretending to help Rina look for Nada. However , he wasn't all that bad as he did SAVE Nada and did his best to keep her alive. And the end of the series??? Alex and Rasty end up happily together despite their break up. Alex will be a good guy..
Ricky and Nada will get married and have twins !!!! for yourself? I wouldn't mind publishing a post or elaborating on a few of the subjects you write with regards to here. Again, awesome web site! fact remarkable in support of me. piece of writing provides fastidious understanding even. lot of your post's to be precisely what I'm looking for. can you offer guest writers to write content in your case? I wouldn't mind creating a post or elaborating on some of the subjects you write with regards to here. Again, awesome website!